An original letter of correspondence between Joshua Coffin Chase and Brockelman Brothers, Inc. 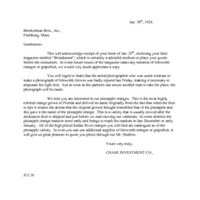 Topics discussed in the letter include the Brockelman magazine Broadcaster issue about Isleworth Grove, additional mention of the Isleworth oranges and grapefruit in future issues, the injury of the company's contracted aerial photographer and subsequent need to find a replacement, and the pineapple orange. Original letter from Joshua Coffin Chase to Brockelman Brothers, January 30, 1928: box 49, folder 20.84, Chase Collection (MS 14), Special and Area Studies Collections, George A. Smathers Libraries, University of Florida, Gainesville, Florida. 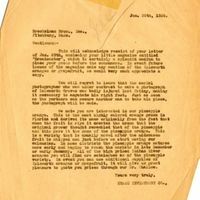 Digital reproduction of original letter from Joshua Coffin Chase to Brockelman Brothers, January 30, 1928. This will acknowledge receipt of your letter of Jan. 29th, enclosing your little magazine entitled “Broadcaster”, which is certainly a splendid medium to place your goods before the consumers. In event future issues of the magazine make any mention of Isleworth oranges or grapefruit, we would very much appreciate a copy. You will regret to learn that the aerial photographer who was under contract to make a photograph of Isleworth Groves was badly injured last Friday, making it necessary to amputate his right foot. Just as soon as the partners can secure another man to take his place, the photograph will be made. We note you are interested in our pineapple oranges. This is the most highly colored orange grown in Florida and derived its name originally from the fact that when the fruit is ripe it creates the aroma that the original grower thought resembled that of the pineapple and this gave it the name of the pineapple orange. This is a variety that is usually moved after the midseason fruit is shipped and just before we start moving our valencias. In some districts the pineapple orange matures more early and beings to reach the markets in late December or early January. All of the high priced Indian River oranges you will find are catalogues as of the pineapple variety. In even you can use additional supplies of Isleworth oranges or grapefruit, it will give us great pleasure to quote you prices through our Mr. Shallow. Chase, Joshua Coffin. 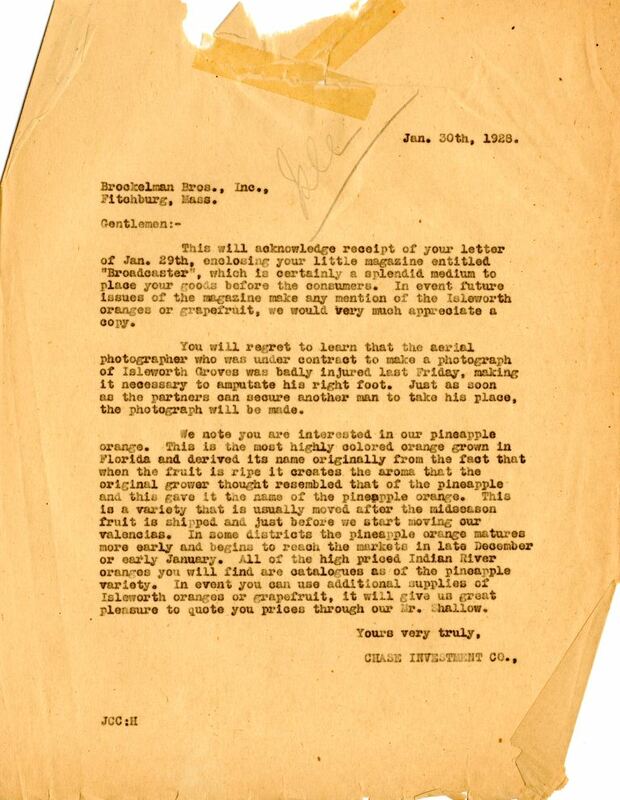 “Letter from Joshua Coffin Chase to Brockelman Brothers (January 30, 1928).” RICHES of Central Florida accessed April 19, 2019, https://richesmi.cah.ucf.edu/omeka/items/show/2700.